Often times going into a musical, I will have already listened to the original Broadway recording. Perhaps to familiarize myself with the music, or because the show has been around for a while – in either case, I have something to compare the performance to. But going into Memphis I did not. I had heard many positive things about the show, and had high expectations as I took my seat inside the Fabulous Fox Theatre. 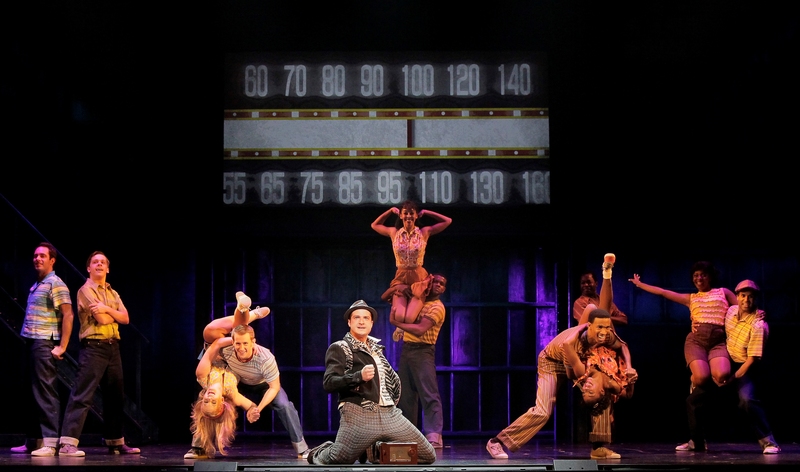 What followed was two and a half hours of my eyes glued to the stage, as I took in the dynamic rock n’ roll music and powerful performances that make up the first national tour of Memphis. The show of course takes place in none other than Memphis, Tennessee during a time where music and clubs were segregated like everything else. Radio stations in the center of the dial didn’t play “race songs” as the show puts it, and white people certainly didn’t go to clubs on Beale Street. But it was the beginning of change the day that Huey Calhoun (BRYAN FENKART) walked into Delray’s, a black club featuring the vocal talents of the owner’s sister – Felicia Ferrel (FELICIA BOSWELL). Huey hears the regulars singing and dancing (“Underground”) and can’t help but to stop in, but stands out like a sore thumb. The regulars start to leave, thinking that he must be a cop or something, but he sits at the piano and convinces them through song (“The Music of My Soul”) that he simply loves their music and can’t get enough. Delray (QUENTIN EARL DARRINGTON) and the others are skeptical of Huey’s intentions, which he must prove are pure as he promises to help Felicia get her music on the radio. The show starts off with a bang right from the beginning. As soon as we are taken to Delray’s, the powerful music starts playing and the rock n’ roll dance party begins. And when you hear the powerful vocals of Boswell and Darrington during “Underground” you know you are in for a good performance. Felicia lights up the stage with her beautiful and powerful voice, taking us through a plethora of emotions throughout the show. Bryan Fenkart walks into the club as Dewey for the first time, and automatically steals the show. The actor played the understudy for Dewey on Broadway, and it there is no confusion as to how he landed the role for the first national tour. His performance may be one of the most likable and charismatic I have seen on stage. I would challenge you not to laugh almost every time he opens his mouth. His character, a simple-minded music loving southern boy, is cleverly written and is genuinely hilarious. Fenkart puts all of his energy into the role, and it clearly shows as he is jumping onto counters – singing and dancing as he sells records to a department store of stiffs-gone-wild (“Scratch My Itch”). His performance of “Memphis Lives in Me” toward the end of the show is breathtakingly good. Memphis has a great message, showing just how similar people are regardless of the way the look. The show is based on real-life Memphis DJ Dewey Philips who played black music on the radio before it was acceptable. Racial integration through the love of music and dance makes for an exhilarating story, written by Joe DiPietro (I Love You, You’re Perfect, Now Change). The music written by Bon Jovi’s keyboardist David Bryan is energetic, powerful – and hard not to get stuck in your head. 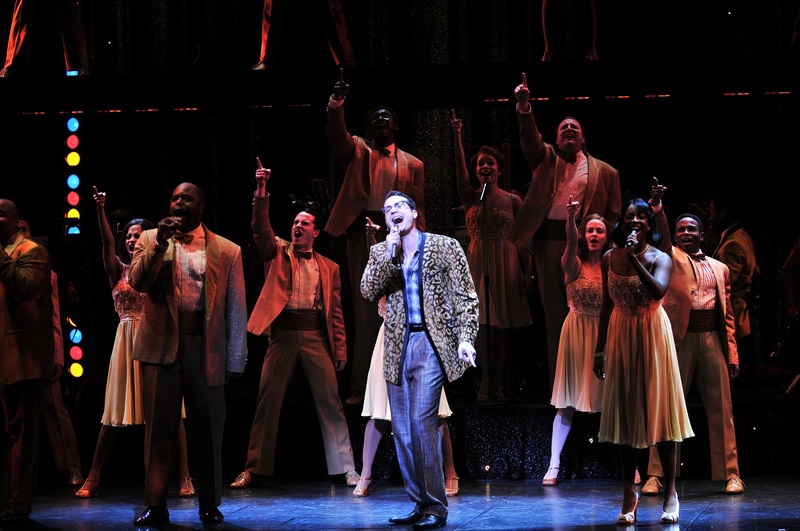 It is no wonder why the show won Tony Awards for Best Musical, Best Book of a Musical, and Original Score in 2010. If songs like “Everybody Wants to Be Black,” “Someday,” and “Stand Up” aren’t toe tappers, I don’t know what are. 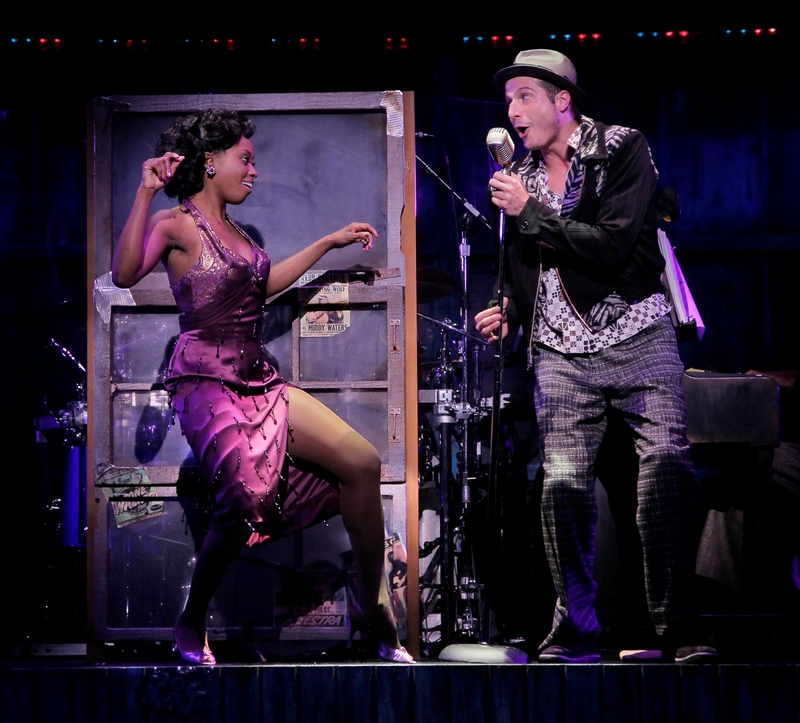 The sets and costumes are wonderful, taking you right back to 50’s Memphis. The way the stage smoothly transforms between Delray’s club, Huey’s home and then his television studio is exceptional and goes off without a hitch. During the period where Huey gets a variety TV dance show (an “American Bandstand” type program), there are actually two cameras on either side of the stage broadcasting live to a screen above the actors. It is a really clever concept, and added a unique touch to the show during those scenes. Memphis is bursting with life, from the charismatic performances to energetic music and dancing. The original story never ceases to be entertaining, and holds a powerful message of standing up for what’s right – regardless of what other people think. Things have come a long way from the 1950’s, thanks to people like Huey, and Memphis shows how much of a difference people like him can make. There is a lot that we can take home from the fun-filled show, including a trip to the theatre that will long be remembered. 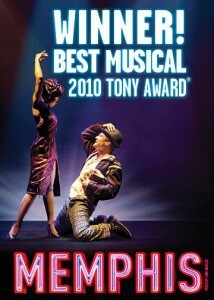 MEMPHIS is playing the Fabulous Fox Theatre in St. Louis from May 1 to May 13, 2012! Performances are Tuesday-Friday at 8pm, Saturday at 2pm & 8pm, Sunday at 2pm, Sunday, May 6 at 7:30pm and Thursday, May 10 at 1pm. The running time is 2hrs, 20 minutes and tickets range from $15 to $75. Purchase tickets at Metrotix, or visit the Fabulous Fox website for more details.